High streets have changed since the 60s. We take a look at a few images of shops and shopping from the past. In the 60s and 70s a modern, cutting-edge shopping centre was essential to towns small and large. The prevailing style was modernist: square buildings with flat roofs. Enjoy our brief trip down memory lane! This shop is still Boots, although the window has changed quite a bit since 1960. It is at 12 Arndale House, Victoria Road, New Washington. 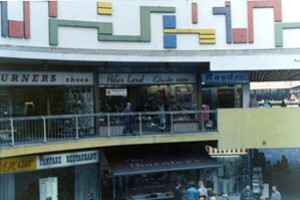 The building is a typical modern shop from the 60s. This shot from around 1970 shows St George's Shopping Centre in Preston, Lancashire. Opened in 1966, St George's had this colourful mural. Unfortunately, it has been subsequently redeveloped in 1981 and again in 1999. Woolworths has only recently disappeared from our high streets. In the 70s and 80s it was a major retail force. The record department was a long-standing favourite for teenagers. Both Woolworths and W H Smith sold music in a big way in the 70s and 80s. Thanks to a reader we know this is Brighton Square in Brighton's Lanes. The pictures appear to be taken in the late sixties. It is a pretty new development. There looks to be a bar called Vasso selling Whitbread on draught and there are some small shops, called Plus One and Aqua Sprite. Sadly it has been re-developed losing much of the original character. Corporation Street in Birmingham in 1970. 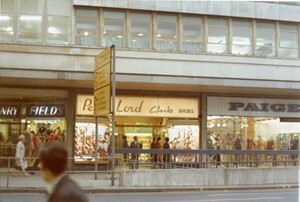 You can see Peter Lord shoe shop and Paiges (ladies fashion). This row of shops is at Rustington, a small seaside town on the Sussex coast. You can see a branch of Halfords, Woolworths and some local shops, what looks like an estate agent, a jeweller, a fashion shop called Edlows and Jordan and Cook, a local surveyor.